Tis the season to host parties–at least now that we have a house to host them in–and G & I hosted our first Casa G Christmas Party this past Saturday. For the fete, I whipped up a couple of batches of Christmas cookies from the family archive, as well as some savory hors d’oeuvres, and a honkin’ huge batch of locally-sourced eggnog (with a carton of Silk Nog on the side for those who wanted a dairy/egg-free version to lace with bourbon). The eggnog, actually, didn’t take nearly as much work to whip up (literally) as I was afraid it would, and I used the New York Time’s 1958 recipe which called for a dozen eggs and 3 pints heavy whipping cream. I advertised it as low-fat, low-cholesterol. (hehe) I’m aware that it isn’t, and that it isn’t remotely vegan, but with local eggs and cream, it was over the top good, and, as the Times says it must be, thick enough to be eaten with a spoon. 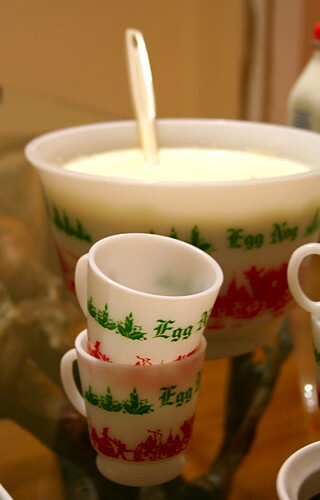 Plus, who can resist the amazing Pyrex Eggnog Bowl & cups I picked up at an antique store last summer for only $15? Le cute! 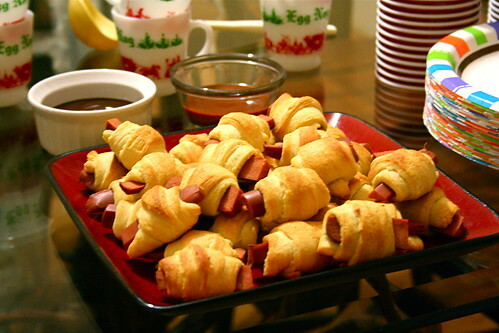 Hors d’oeuvre wise, I made the crowd favorite–vegan pigz in a blanket made with the oh-so-delicious Good Dogs, sliced up and wrapped in Kroger brand crescent rolls, and served with smokey and spicy BBQ sauce for dipping. I seriously love those things and I’m glad my friends do too. 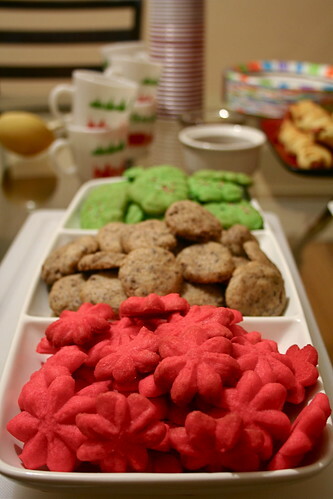 Below, however, is a veganized version of some probably now deceased relative of mine’s recipe for “Sand Tarts”–little bite-sized shortbread cookies made with brandy and chocolate. It’s impossible to go wrong with those two things, actually. The cookies were always a favorite of mine growing up and, as recently as last year, I could be found sneaking them from the freezer to nibble on at my mom’s house in Mobile when I visited her for the holiday. They’re super simple to make and a perfect treat for taking to parties or just snacking on this week and next–I mean, who doesn’t need more buttery, chocolatey, boozy things in their life right now? Pour the chocolate chips into a food processor. Process until the chocolate chips are a ground. Set aside. In a large mixing bowl/bowl of a mixer, cream the Earth Balance and sugar. Add the egg substitute, brandy, vanilla, and salt. Beat until well combined. Add the flour, beat till a dough forms. Add the ground chocolate chips, mix until just combined and the chocolate is thoroughly mixed in. Shape into small, teaspoon sized balls and place on baking sheets. Slightly flatten with fingertips. Bake for 7-8 minutes, until the tops are slightly firm when pressed on. If the sides are browning, remove instantly–you don’t want that to happen. The cookies will harden as they cool. i have never heard of sand tarts before but they look great! your holiday party looks like a blast with lots of festive desserts, snacks, and drinks! Sounds like you know how to throw a party! I love your pyrex dishware, too. It’s all so perfectly festive. 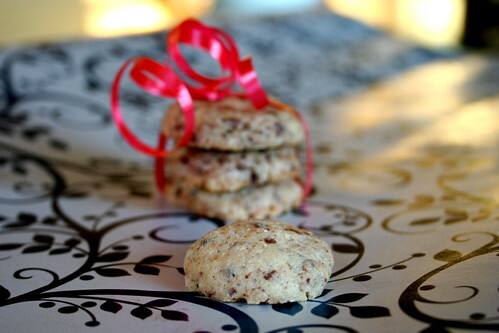 I love the idea of ground chocolate chips in a crumbly cookie. I probably have all the ingredients right now. I should have baked these instead of pumpkin muffins…I kind of ruined those. Happy holidays to you and yours, Jes. I love sand tart cookies and those vegan “pigz” are brilliant! What a festive spread – and best of luck in your new home!